It was never my intention to go to see U2 on their current world tour being just a casual fan but I wanted to have a quick look at the Ticketmaster site to see if all dates had sold out and when I found myself on the checkout screen with 2 good seats available I just said what the hell, might as well go! I’d only been to see U2 once before in Slane and was a bit knackered having to stand in a field all day (my last outdoor/field type concert!). The sound was a bit crappy too so I wanted to make up for that by seeing them in a more comfortable venue. I managed to get good seats for the first night in the lower Hogan stand at the end of the stadium where they had to put the stage/claw. 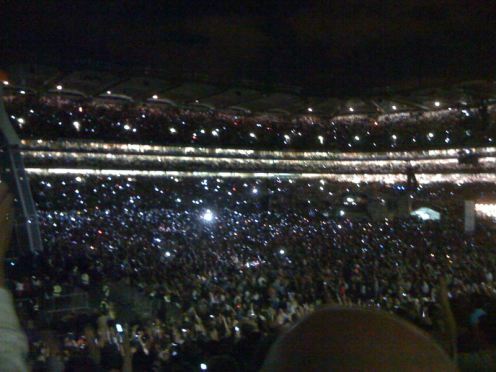 Croke park couldn’t allow the stage to be centered due to safety restrictions on Hill 16 but it suited us as we ended up right in front of the action! The support acts, Damien Dempsey and Glasvegas were odd choices with the later completely boring the crap out of both of us! U2 came on at about 9pm after Space Oddity by Bowie and with a little less fanfare than previous shows (remember the Lemon!?) or the mighty stage setup suggested. They started off with a few songs off the new album “No line on the horizon” which I’d been listening to for a week or so before hand and loving. I’d been looking forward to hearing “Magnificent” and it was a pretty good version. 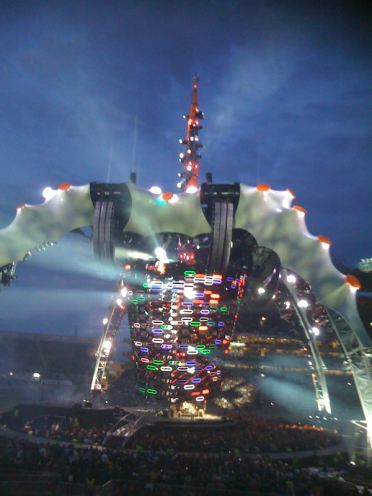 As the show went on U2 seemed to pick up pace and the crowd, a lot of which were pretty late arriving, came alive. 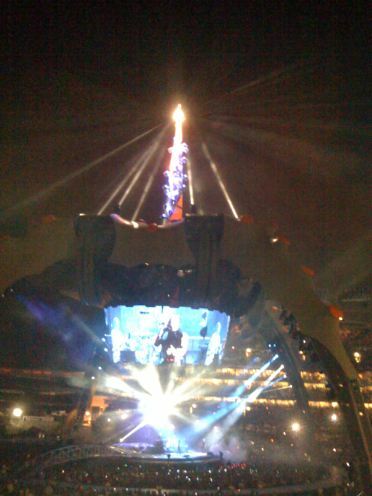 Bono’s vocals were better than expected and the overall sound was pretty good. Highlights for me were “Magnificent”, “The Auld Triangle”, the Acoustic sets, Bloody Sunday and Bono’s Laser Coat and Mic Dangling! Lowlights included whatever song that was were Larry came out for a walk with a bongo and the nonsense with the masks!I was also a bit surprised that there was no encore. I can’t remember the last time I was at any kind of gig and the band didn’t come out to do 1 or 2 more songs although in fairness, they played a long set and the audience didn’t really demand more. 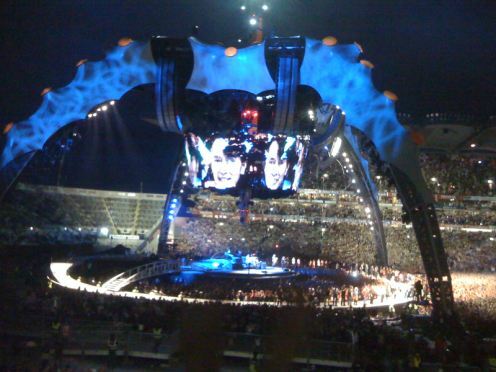 However, the undoubted highlight of the show was not a performance, song or event but the actual stage itself! As it got darker the ridiculous thing lit up in all sorts of amazing ways and you couldn’t take your eyes off it. At one point about midway through and almost imperceptibly, the massive 360 degree screen expanded downwards to about 3 or 4 times its original height! 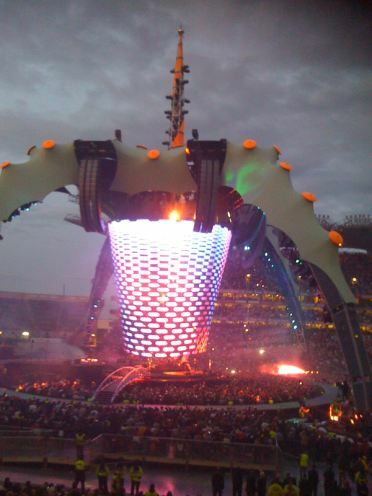 Towards the end, the glitter ball I’d noticed at the top of the spike emanating from the claw and rising above the height of the Croke park roof, came alive and drenched the audience and possibly most of Dublin city in beautiful sparkles. About the only thing the stage didn’t do was get up and walk about! Maybe for future U2 gigs..
All in all it was a memorable show and proof that U2 are still the biggest and most original band in the world. 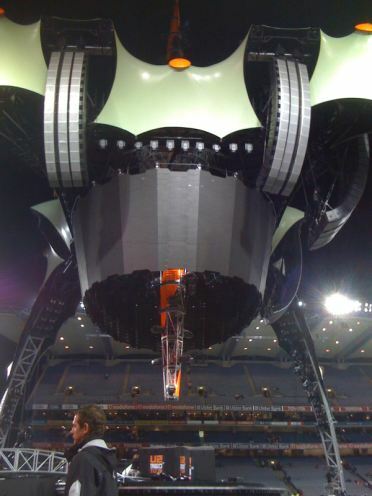 Even though U2 is not one of my favourite bands I had the chance to be in Istanbul by the time they had a concert there and honestly they did a great show. Definitely one time in a life experience. Thoroughly agree with Eamon. Was at both Saturday and Monday night gigs and on Monday night I was in a part of the Hogan stand that I can only say was filled with lifeless bodies! People who knew nothing about the band, their songs or anything and just wanted to say they’d been there. We still had an unforgettable weekend and to hell with all the begrudgers! 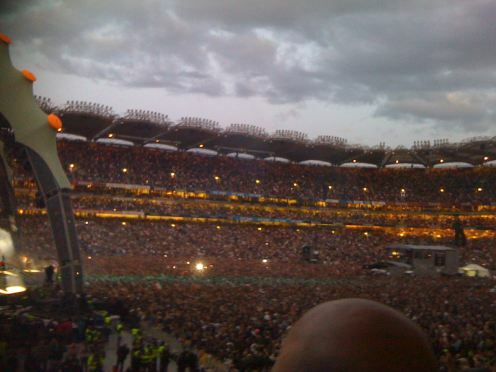 U2 were magnificent as usual and feck the many, jealous begrudgers on here. Glasvegas were far from boring but the audience were rubbish. IF Elvis, Jimi Hendrix and Johnny Cash rose from the dead and played in that slot before U2 the audience would probably still have acted brain dead. Leon I just have. My vocal range whilst on the phone to NTL customer service has far exceeded anything Bono can do. On a final note (wow I must form a super group with a pun like that) the only original thing about U2 nowadays is the technology and in fairness anyone can do that albeit on a smaller scale. @ Fattony Bono IS a great singer, he has a great range, try hitting some of his high notes.. I have never heard anyone say Bono has a great voice. He’s a performer not a singer. Regarding lyrics – talk is cheap. Its very easy to to pontificate from a mansion on a hill. U2 are gradually becoming the new rolling stones. they’ll continue to tour every few years and break their own box office records. Firstly, I’m not a U2 fan but I like the classic tunes they have given us. I was at the Friday night show and I put up with the mediocre support acts until the main event! “average performance”? I thought it was a great show and for a 49 year old man (is he that old?) he has a great voice and still works an 80,000 strong crowd for 2 hours with ease!!! Maybe he goes on a bit much on certain things but I think he is great for trying to spread a message and make a slight change in this world. 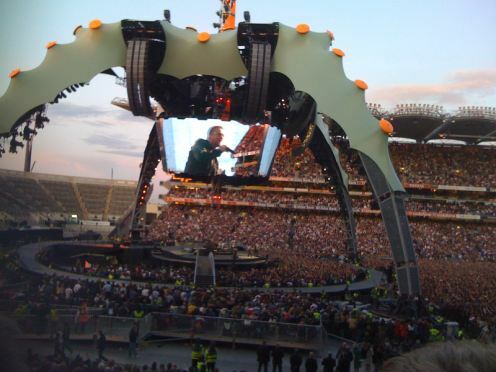 Granted, we were all there for the show not a lecture but he has done and still does great work for those whose lives don’t include the luxury of going to see a U2 concert at any point in their deprived lifetime. How quickly do you forget the lyrics of “One” that you probably sang along to so poignantly last friday! Went to U2 Friday night. Take the stage out of the equation and it was a very average performance. Bono is becoming more intolerable with each tour. Overall glad I had a free ticket but not sure I would go again – free or nah. no line on the horizon is actually a great album, its an absolute grower! stand up comedy, fez being born and moment of surrender are highlights for me but thats not to say the rest of the album is inferior by any stretch of the imagination. you go out and write a better album! @Simon As Paul says, No Line on the horizon is pretty good after a few listens and “Magnificent” is a classic U2 anthem but its all just opinion. Don’t forget all their other albums either!? On another note, its amazing how we Irish begrudge perhaps our most successful export. Apart from some dodgy tax issues and endless pontifications, Bono and U2 have done more for the country and society as a whole than any of the rest of us ever will. Myself and Neil seen them last week here. Thought they were great and the stage just out of this world! Looks better in Crokers though with an open roof stadium. Made me laugh your comment about the guys getting hauled up the legs of the claw, thought at the time it would be the coolest job, for one night! Any idea what they plan to do with the stage and screen after? A New landmark for Dublin, should get some interesting names. Laser jacket is on top of my list for Santa. Heard the dutch show was crap actually!? We’ve already got a stoopid spike in Dublin so they can put that stage with the rest of the lemons and arches..
Who else puts shows like that on these days man! ?